While we usually see a slowdown in real estate this time of year, this year we are seeing steady activity and even a bit of an uptick! This good news is in part thanks to our high-tech industry which is bringing in a steady stream of employees. Read more about it in the monthly press release by our Multiple Listing Service which I am archiving on my website. 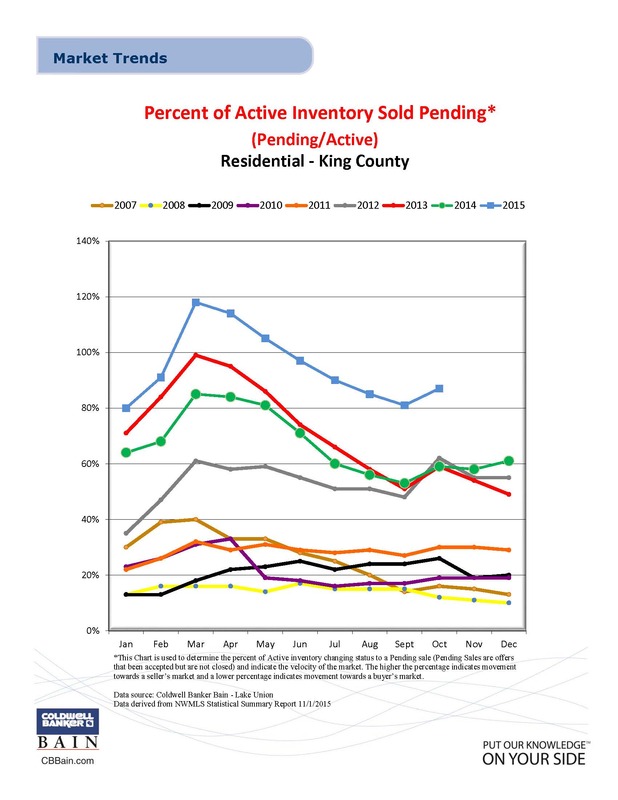 This means it is still a seller’s market – a great time to sell! That said, overpricing a home even in a seller’s market could have deleterious effects such as the listing sitting on the market for a long time and becoming stale. It is a much better strategy to price a home at a reasonable price point and have an offer review date. In Seattle, most homes with this strategy are only on the market for about a week! I would also recommend having a plan once your home does sell. This may seem obvious, but an elderly couple walked into an open house the other day and was very excited that their home of many years on Queen Anne had sold, but they were in a bit of a panic on what to do next. Sometimes one does need to sell a home to buy a home and so finding a nice extended stay hotel, “whole house” AirBnB or space at a relative’s home can make those view days or weeks more comfortable. Appreciation Rates from October are out, thanks to Rainier Title. This last month I attended a seminar on investment properties. I joined about twenty brokers on a tour of ten properties. We collaborated on why each would or would not make a good investment and then voted on the best property. The properties that had the most opportunity were those that needed updating and we discussed how much we would put into each. This varied from $10,000 in the kitchen to $5,000 in the landscape. Adding a backsplash in the kitchen is an easy way to upgrade the look and feel as well as using flooring with large or no pattern to make the area look bigger. It was pointed out that if one is going to redo a bathroom to stay away from the temptation to add a shower insert but instead to spend a little more money and tile. It was also recommended to paint the doorframes white (although I love natural wood and was sad to hear this!). Removing a popcorn ceiling can be about $1/foot (although test it to see if it contains asbestos – removal will be more expensive). Paint? Bubbly for ceiling and Lyndhurst Gallery Beige by Valspar for the walls. Those are just a few of the tips – contact me if you are interested in more! Moving on to the wealthiest neighborhoods – here is an interesting article by the Puget Sound Business Journal: Wealthiest Neighborhoods. None of these are that surprising but I was interested to see Fox Island listed. This island is just over the Tacoma Narrows Bridge and is accessible by it’s own little bridge. With appreciation rates in Tacoma at 20% it may be a good idea to find an investment property there and see it go up! See the “Newsy Links” page for more of the latest real estate related links! Who can you think of that could use my help buying or selling a home? I appreciate any referrals as mine is a referral based business. I would like to offer a $75 gift card of your choice for any referral that results in a consultation! My office is located on Lake Union. I meet clients in the conference room with a beautiful view of South Lake Union, the Museum of Natural History and Industry and the Center for Wooden Boats. We also have a Starbucks and Mccormick and Schmick’s in our building for optional meeting places.